The SPEEDIO Series is a series of #30 spindle compact machining center, higher productivity than our CNC Tapping Center Series and demonstrates excellent environmental performance and machining capability. 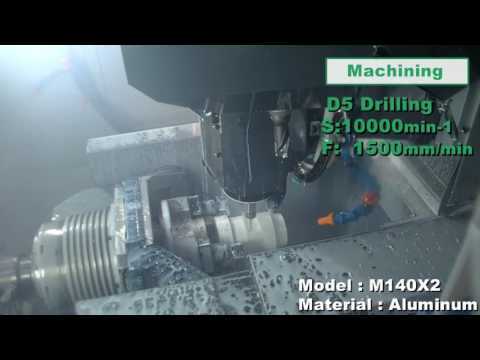 "High machining capabilities" and "stable machining" have been achieved. "Machining larger workpieces using #30 machine" The release of the S1000X1 machining center sees an override in the conventional machining areas of #30 machines. A new model that is standard equipped with a pallet changer has been added to the SPEEDIO series that achieve overwhelming productivity. The machine demonstrates high productivity, and also provides the largest machining area among "QT table" machines, enabling the mounting of large jigs that was not possible on conventional machines. Equipped with SPEEDIO's Largest Tool Magazine! High accuracy, High productivity, Extended service life. What is a "SPEEDIO" ? Contact information for distributors in your area. Contact information for Brother Technical Centers in Europe and other areas. There is no New Exhibition information. Oct. 24, 2018 New release SPEEDIO's highest level machining capabilities "F600X1"
Oct. 24, 2018 New release SPEEDIO with pallet changer "R650X2 40 tool magazine"
Nov. 15, 2016 New release Special SPEEDIO Option Rotary Table "T-200"
Jun. 16, 2016 New release Compact multi-tasking machines "M140X2"
May 13, 2015 New release SPEEDIO with pallet changer "R650X1"
Oct. 30, 2014 New release X-axis stroke:1,000mm "S1000X1"
Jan. 31, 2014 New release X-axis stroke:300mm "S300X1"
Jan. 10, 2014 New release SPEEDIO with Pallet changer "R450X1"